With a newly updated article on a popular topic at On Stage Lighting, we look at stage lighting design software and CAD options when it comes to planning and communication in our lighting world in an extended Guide To Choosing Stage Lighting Design Software. *Subscribe to get more CAD video resources at On Stage Lighting YouTube channel, including tutorials on Vectorworks and AutoCAD. Whilst being no stranger to scribbling a lighting plan on the back of a tour schedule with a biro (usually as the first few rigging boxes are coming out of the truck), you may want to present your ideas and technical information in a clear and more professional way. As the complexity of the design increases so does the number of people involved in making it all happen and the consequences of a planning or communication mistake. If you have ever swapped out more than 150 Source Four Par lenses from a massive 20” box truss trimmed at a height of 7m because the LD should have specified ‘wides’, then you’ll know the cost of shoddy calculations. 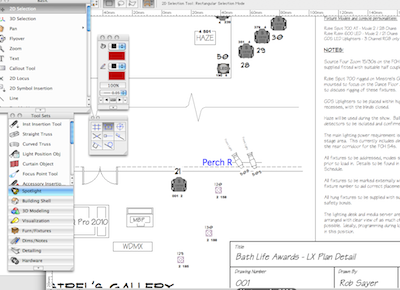 Using a computer to help the lighting design process has many advantages over traditional hand drawn lighting plans and manually collated data methods. These range from A for Accuracy all the way to Z for, well, Z: The 3rd dimension in 3D CAD modelling (a useful part of getting those calculations, angles and distances right). There are also great possibilities in digital storage and collaboration, reuse of previous hard work and just generally getting a computer to take the donkey work of repetition or maths when planning lighting design and system. The pitfalls to using software in lighting design are similar to the use of computers for any other purpose. The dangers of digital file storage, crashes or file compatibility are familiar to most in the modern world, along with the steep learning curve required to be able to work as effectively using the software as with paper and pencil. Even in an age of seemingly “free everything”, the cost of owning and updating specialist CAD software must be a consideration, particularly with the most comprehensive packages. We will also look at some software with extremely specific uses with which the cost of ownership must be weighed against the amount of actual use for a given user. This article will refer to this use of digital software tools as CAD in the “Computer Aided Design” sense, as not all the tools available to us a lighting designers are used for drafting. It will consider specialist stage lighting software, and also look at more generic applications that can be used for parts of the design process. What Do We Need From The Software? Noting of data and, as important, changes such as cue lists, focus notes, equipment shortages. Calculation and communication including power requirements, circuit information, weight loadings. You may notice that, while a few requirements are planning tools simply for the Lighting Designer, the majority of items in the above list centre around communication with others. If you are going to be designing a show, owning and preparing the equipment, rigging it and operating the lighting system in isolation you could get away with nothing more than a few Post-It notes and making it up on the day. Even this would assume that you didn’t have to agree with the Sound department where their speakers would go or show the riggers where to put your points before you arrive. Putting on shows is nearly always a collaborative effort, and successful collaboration comes from effective communication. It’s a good time to look at collaboration in lighting software, as ‘cloud computing’ is becoming a buzzword throughout a wider world than simply the early adopters. Before we even consider ‘software as a service’ in specialist stage lighting applications, we might reflect on the benefits of digital file sharing that doesn’t involved pinging emails backwards and forwards and wondering if you have the latest version or can even open it. Using services such as Dropbox, our stage lighting partners can easily work on the same files in a single place and always have access to the latest version of the lighting plan or the equipment inventory. For a while now, I’ve been a huge fan of Google Docs (now generically called Google Apps) which not only allows for such file sharing but also puts the software functions of word processing and spreadsheet firmly in ‘the cloud’. Providers of stage lighting design software are moving into thecloud computing space and functionality that puts the emphasis on the collaborative nature of stage lighting planning. By way of example, Vectorworks (the base production of the Spotlight lighting design software) has specific cloud services and John McKernon’s Lightwright was always designed with a portion of it given over to the concept of different ‘users’ and tracking changes, not just presenting the current state of play. While Lightwright has some great lighting design specific tools and a huge amount of thought has gone into it, such a collaborative concept can be also be found generically in a shared Google spreadsheet. Different stakeholders have access at different levels, changes can be made and are and can be reverted to. All in real time and for free in the case of Google Docs, if you are prepared to put in the time create your own. Perhaps in the future On Stage Lighting will do a series of tutorials on using Google Docs in lighting design. How much of my time do I spend using ‘x’ function? Do I get paid directly for doing ‘y’? How much time ( = revenue, opportunity cost etc.) will I save if I start using ‘z’? Do I just fancy a piece of fancy software to mess about with? An answer of “yes” to the last question is a perfectly valid one, but one that should be answered truthfully. Stage lighting design software can be extremely expensive to own and in my experience the most comprehensive (read:expensive) does often not fall into the “good buy” category for your average independent Lighting Designer based on the economics. Also, there is a temptation to think that being able to use, even better, own such shiny software makes you more employable and even a better LD! This is not the case. While being able to use CAD is a useful skill it does not make you a Lighting Designer, better or otherwise. As a freelance LD making your own way, running the latest version of the fanciest software is a lovely overhead eating into your profit unless it can be financially proven that you are actually more productive or your client experience is so improved that it keeps you ahead in the game. Or at least stops you falling behind. Perhaps it’s already becoming obvious why in the world of fast turnaround events, the biro/tour schedule system of communication is often favoured. No one, not the client, not the ad agency, not the production company, nobody, is going to pay for anything. Why would they when the show will happen with or without all those beautifully crafted drawings and lists? Why bother when it doesn’t matter to them how awkward your workflow is, so long as the show opens? Not all that many Directors / Clients / Mums know a good lighting design from an average one. In the end, they certainly can’t tell if your design has been lovingly wrought in layers of vector-based beauty from the most expensive Bezier curves money can buy. Or if you drew it in chalk on the floor. The show either looks good and the minimum number of creatives had a crying fit. Or not. At the concept or pitch stage, there is an case for an expensive computer-generated finish, but we’ll discuss that later. There is also an argument for you making your own life more bearable or enjoyable with the use of dedicated lighting software, but this should not be confused with an actual business case. In order to even need to be more productive with fancy software, you need to have a whole lot of relevant lighting gigs in a year. All this means that you should seriously look at the free / cheap end of the lighting software market first and consider all the information below before making that big purchase. However, with the need for collaborative communication, professional outputs in your field and cost in mind, let’s plough on. To generate simple schematics and two-dimensional lighting design layouts so that your crew can rig and set up correctly is the minimum software requirement by any Lighting Designer. The ability to cleanly draw a lighting plan, print it out or email it. You can actually draw a lighting plan using MS Word if you need to (I’ve seen it done!) but life is too short for bad drawing with a word processing software when you could be producing bad drawings in a more suitable package. Whether the application uses the ‘CAD’ title or not, the key thing we’ll need is something ‘vector’ based. Vector drawing uses mathematical equations to create lines, curves and solids which means they are accurate, completely scalable and resulting drawings or details are disconnected from screen or print resolutions. Layout of 2D lighting symbols based in ‘raster’ format (bitmaps, basically images) on a plan without accurate dimensional information isn’t ideal and really only a digital version of our scribbled biro drawing. Any mainstream vector drawing software will produce a nice lighting plan with annotations showing colours, circuits and focus information. If you are already familiar with Adobe products, we are looking at Illustrator rather than Photoshop, and there are plenty of vector titles available including free software. The downside to using a non-lighting specific CAD packages for the production of 2D lighting plants is their lack of scaled stage lighting symbols to drag and drop into your plan and the immediate availability of other stage lighting data such as manufacturer details or specific calculations etc. The difference between vector based graphics software and dedicated CAD products is only really the presentation of the tools, in particular dimensional and other data entry and reporting. The difference between generic CAD software that might be used by architects or engineers and stage lighting specific drawing packages is again the presentation of the tools, with developers putting what the lighting designer needs front and centre. Professional CAD software generally has the functionality that we could shape for our needs, stage lighting design drawing packages have just already shaped them and put them into toolbars with names that we recognise. Then there is collaboration and integration with other systems such as being able to use existing venue plans or add stage lighting data to a drawing from another CAD software. Any drawing software that can cope with the AutoCAD standard .DWG and .DXF formats is a must when working alongside others with similar capability, for when you don’t all use the same CAD software. The ability to import these formats can be used with lighting symbols that are available from equipment manufacturers but it is vital to watch out for scaling errors when importing symbols this way. In fact, when working with imported vector data such as .DWG and .DXF drawings, watch out for scaling errors in general! Such errors have the power to make grown men weep into wireless ergonomic keyboards. The most dedicated lighting design drawing software packages can save you the trouble of importing loads of different lighting symbols by shipping with their own fixture library. They also usually come with with the ability to generate some useful lists such as fixture quantities and gel cuts based on data attached to the symbols. The level of complexity or functionality is, unsurprisingly, related to software cost when these functions are built into a thing with “CAD” in the title. Choice: If you need to draw 2D plans and are on a budget, get the extra usefulness of one of the free or cheaper lighting design software or basic generic CAD packages . Don’t mess about with raster based image software or something totally unsuitable like Powerpoint. There are free / cheap options that are better suited, some of which are listed below. Ideally find something that will be able to deal with the .DWG files that are thrown at you unless you are going to be simply producing neat lighting plans for others to follow with minimal external input. What if you want to do more than draw a 2D lighting plan? What about all those lists, calculations and the communication of technical information in other formats other than a CAD drawing. Using MS Word as our example, you can use Word (or Open Office, Works, whatever) to create neat a list and store it in digital format. What you don’t get from a simple word processed list is the benefit of good quality spreadsheet functions. 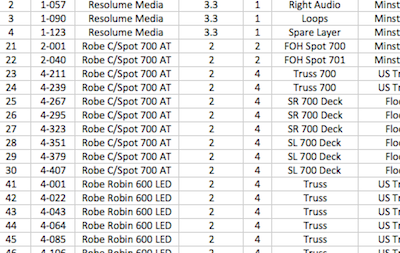 For this reason, many lighting designer’s have made good use of Excel and other spreadsheet software for many years to deal with equipment totals, cable, accessories and gel allocations. Without an advanced knowledge of spreadsheet functions, we can still benefit from be able to at least set up an Auto Sum or tally and, using something like free Google Spreadsheets, collaborate on these lists in real time. A database / spreadsheet model is the angle Lightwright, Focustrack and things like Cast’s WYSIWYG reporting functions come from. The benefit of these specialist pieces of software is that a lot of care and attention has gone into creating something that works out of the box for the lighting designer. Some of these CAD packages or software combinations can have their data input at the drawing or at the list, depending on the way you like to work as an LD. If you would like to get your software to provide extra features such as sectional and elevational drawings, basic 3D views and organise information, then the more robust lighting design software is a better option. The benefits of creating your CAD design in 3D is that you don’t have to keep redrawing sections and elevations and instead can view the “model” from any angle even in different finishes. You also have 3D geometry that you can use for visualisation or pre-programming either within the software or for import into another package. These packages can “model” your theatre space or venue, including your set and lighting rig which can take the effort out of creating sections or elevations. Using different views of a 3D space are vital in lighting design, particularly for a theatre show, to help you make decisions of angle, light positions and flying heights (and it sure beats doing lots of different drawings!). Equipment lists, lighting accessories, gels and control channels can be generated by the lighting plan drawing process which saves time and effort on your part while electrical power calculations or weights can be easily viewed. Choice: If you are working in lighting design and do a lot of shows but do not need to pre-program or see fancy visualisations of your show, you will be looking for a combination of 2D / 3D CAD and spreadsheet software. These can be found as different entities such as using AutoCAD (with or without the LD Assistant plug-in) and a generic spreadsheet software like Excel. Alternatively, these could be rolled into one like Cast’s WYSIWYG or, in the case of Vectorworks Spotlight and Lightwright, be complementary software that bolts together to share data and work in sync. While still in a communicative frame of mind, we should consider the business of visualisation. In this case, we are looking to be able to demonstrate to interested parties (Directors, Clients, your mum etc.) what our lighting might look like if only we were given the gig or allowed to have all that expensive kit or what would happen if we blew the entire gel budget on Follies Pink. For me, the key to concept visualisation software is to produce credible images (sometimes even video files) of key points in the show, and produce them with the minimum of time cost. This is because much of the work of visualisation is done before contracts are signed, gigs got or anyone has even agreed to a hire budget. So, what are our options for this kind of visualisation? The cheapest form of visualisation of show that is yet to happen could be images from a previous show that have corresponding design elements. If no relevant image is available then the Lighting Designer might create something, either using their art material of choice or even lighting a 1:25 scale model of the set and taking photos of it. The digital step up from this is photographic images that have been through a Photoshop style editing software to create an impression of what the Lighting Designer wishes to communicate. This might be based on a venue shot or an artistic impression created by another key designer. In the world of corporate events, visualisation of the environment is often farmed out to a graphics artist to be used by the production company to secure the work. This means that a certain amount of work has already gone into the data for visualisation and created in any number of software packages and presented in a range of file formats, including 3D virtual tours. It’s with this background in mind that the Lighting Designer must choose their visualisation method and therefore select appropriate software. 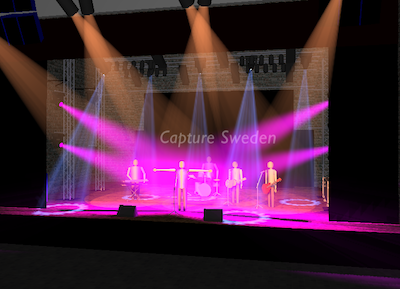 The most comprehensive and specialist of the stage lighting software genre could be Cast’s WYSIWYG or a software set such as Vectorworks Spotlight with Renderworks or even ESP Vision plugged in. WYSIWYG has benefited from steady improvements in the rendering engine, while remaining a broad tool that doesn’t require the Lighting Designer to understand every little detail of 3D CGI shaders and render settings to be able to produce the images. The specialist software also tries to integrate all or most of your lighting design into one process and can spit out plans, lists and visualisation images at any point. A downside to the use of this kind of software vs. generic 3D CGI modelling and rendering packages is the requirement to have already produced your lighting design before you get the images. One of the benefits of something like 3DS MAX or Maya is basically your ability to cheat all kinds of things in order to produce lighting you want your stakeholder to see. Remember that above we needed these visualisations to happen fast, often before a contract, so we need to cheat. 3D CGI graphics is basically the art of cheating physics which brings us to ‘realism’. One of the things that we hope for as Lighting Designers in a visualisation software is realism and having it ‘look right’. Initially we think we can get there through the use of mathematical models and ‘accurate’ materials in computer space to simulate the real world. Architectural lighting designers are big on real data such as photometric lighting, IES models etc. but they are often most interested in measured light levels. The longer I studied 3D CGI graphics, the further I got from the idea that if only I used all the data and the right materials, it would look how I wanted it to. This ignores the vagaries of the rendering engine and all the maths involved in ray tracing, shader specularity and radiosity calculations. This does mean that the Lighting Designer needs to know what the show will look like in order to create the images. If the LD is hoping that the modelling software will show them the end result in lighting terms, they are going to be disappointed. Visualisation software in stage lighting should be used to communicate to someone else, you know in your head to be true. And what you produce at that point may well be the difference between getting the gig and not. Choice: When choosing software for lighting design visualisation, consider at which point in the process you need to create the outputs and if some of the work has already been done by another party. There is no point in spending days creating a full lighting design to produce a visualisation image in CAD if a Photoshop wizard somewhere has already produced a 2D raster picture that you could make adjustments to using a virtual paintbrush. A while ago, I worked with Autodesk Viz (the cut down version of 3DS Max) because many of the show visuals were coming off the desktop of the graphic artist in that format. I simply ‘lit’ the model and sent them back in time for the production company to pitch. It was also easy to quickly import AutoCAD data in 2D or 3D, add some shaders and cheat some lighting. 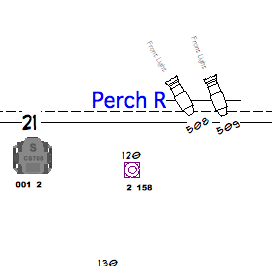 At the top end of lighting design software functionality, real time plotting of your rig is the name of the game. The software enables you to set up your virtual lighting rig with control systems, plug in a compatible lighting desk and plot your show before even committing lantern to pipe. This facility is most useful with large moving light rigs and helps the Lighting Designer and Operator build up some of the elements of a show before setting foot in the theatre. Conventional lighting dimmer circuits can also be programmed although the light intensity levels cannot really be accurately depicted however posh the software is. What pre-programming does assist with is the setting up of moving light positions, palettes and effects and even base cues without the cost of time in the venue with all the kit. This saving is real in the world of performance, but the question of who should bear the cost of running a pre-programming suite is often answered by when you know that lighting production companies are increasingly providing the best software and facilities, along with the actual lighting consoles themselves. The option for cheaper owner/operator consoles may also be linked with the development of cheaper pre-programming visualisers designed to be run from more modest laptops with fewer functionality in the other areas of stage lighting design software. The different software packages available to do this vary in cost, with the cheaper ones often trading off CAD or paperwork capabilities against the facility for real time programming of your light show. All require you to also have a fairly decent PC to run them on plus the hardware to input a lighting control signal (DMX or Ethernet) that will control the virtual lights. Similar to the previous visualisation section, there are things to be taken into account when choosing pre-programming lighting software and they fall broadly in similar areas: Workflow patterns, time required and level of learning needed to get a good result. One of the features of simpler pre-programming software is the ability to place lighting fixtures in 3D space without the need for rigging structures etc. If you only want to see what fixture beams are doing, you don’t need a full set and trusses all over the place and can work with the minimum of information for your programming needs. With regard to the cheating of visualisations earlier on in the process, this flexibility is another plus point for building your own system around a kit of software parts as you can choose to put resources in where required. The converse view of the proponents of the all-in-one lighting design software package would argue that such software provides a central point of creation that reduces repetition. Another element worth considering is native compatibility with your chosen lighting console and the options for sharing of data between them. Only having to create a patch in one place is a time saver. Console specific visualisers such as GrandMA 3D, Avolites visualiser and now the alpha version of the Cham Sys MagicQ visualiser all feature this and WYSIWYG has a long standing tie-up with Flying Pig Systems Whole Hog when it comes to data exchange. The most basic visualisers work using either a DMX input device or ArtNet straight in, while the ones that exchange data use a more proprietary system of communication. From the other end, a visualiser such as ESP Vision works with data and 3D geometry from Vectorworks Spotlight, meaning that your plan and visualisation environment are created at the same time in a similar way to WYSWYG. This is not the case with the cheaper visualisers. The question is at which point you need your visualiser to plug-in to your own working practices and, indeed, which parts of the process you use and which you don’t. There is little point in using a visualiser that integrates beautifully with your CAD drafting package if you rarely produce drawings. If you regularly use a particular console, perhaps you can live with a break in connection with your cheap CAD drawing software and free spreadsheet program in order to have stronger ties with your console data. Everyone will have a different solution. Choice: Software such as Light Converse or Capture are good value visualisers and produce quick results for pre-programming as well as allowing the user to edit lighting fixture personalities as new models are brought to the market. Cast Lighting’s WYSIWYG Perform is all singing and dancing with 3D CAD, good paperwork creation and comprehensive programming and rendering. It is used by professional lighting companies and designers on the biggest theatre shows and events but all these features come at a price and a subscription service keep the fixture library up to date. Such software requires some pretty hefty hardware to run it on. The latest addition to the console visualisation market is the alpha version of the MagicQ vis from Cham Sys. The visualiser is free, basic and works with the also free MagicQ lighting control desk and software, and is certainly going to be of interest of the growing number of MagicQ users around the world. Wherever you sit in the stage lighting CAD market, there are choices to be made. These centre around your own particular needs and working patterns, what your collaborators use and, let’s face it, what you can afford. I have no other relation then been user of this software, not a salerep nor a distributor. Great, thanks. Had a quick check of the website and added for others to try out. Useful to be able to work with .DWG for free.